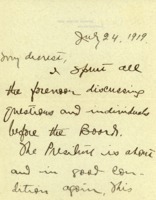 Date is exactly "1919 July 24"
Cary T. Grayson writes to Alice Gordon Grayson about taking a 50 mile motor ride with President and Mrs. Wilson as well as dining with Ned and Mrs. McLean. 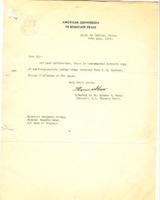 Thomas Shaw to Benjamin Strong Jr.
Thomas Shaw forwards Benjamin Strong Jr. a message from F.M. Gunther.